"A perfect verse for me today." "All praises be to our Lord and Savior Christ Jesus... For being here with my family and I. When we learned about the cancer my baby had and at stage 4...... Lord I love you so.... n. And for delivering and healing and setting us free from that and Lord I just want the world know that you are alive and well.... And all is so well with her AMAN ...."
"Without courage its difficult and impossible to walk in the narrow way. To cut off worldliness and selfishness requires courage. To stand for truth and Christ in the face of threat to life and comfortability need courage. Holy Spirit fill us now! We have no choice than to be courageous." "And the Lord said unto Joshua, This day will I begin to magnify thee in the sight of all Israel, that they may know that, as I was with Moses, so I will be with thee. Joshua 3:7"
"Thank You LORD For Walking With Us DAILY!!!" "What more shall we say if God be for us who can be againt us ?" "And by his stripes we are healed"
"Let us stand fast in the LORD JESUS CHRIST. the time is at hand and soon the days will be darken. Be Strong in the LORD.."
"MY GOD is an awesome GOD." "Still standing on His promise!!!" "Thank you God for being with me!" "Thank you Lord, I will be in spite of everything and everyone around about me. Thank you Lord for being with me wherever I go!!!" "What a commandment. No matter what adversity you are facing in your Christian walk, don't worry (that's the opposite of faith) Ps. 27 The LORD is my light & my salvation; whom shall I fear, the LORD is the strength of my life, of whom shall I be afraid? When the wicked, even mine enemies and my foes, came upon me to eat up my flesh, they stumbled and fell. Though an host should encamp against me, my heart shall not fear: though war should rise against me, in this will I be confident. One thing have I desired of the LORD, that will I seek after; that I may dwell in the house of the LORD all the days of my life, to behold the beauty of the LORD, and to enquire in his temple. For in the time of trouble he shall hide me in his pavilion: in the secret of his tabernacle shall he hide me; he shall set me up upon a rock. David knew His God. So should we. Praise the Lamb of God. Amen"
"After my "special" note this is the 1st thing I see!!?? Ain't God GREAT?????" "AMEN ! Right nw im oof gud courage! shalom"
"Amen! one among my favourite verses in the bible"
"Amen, whreva l go he is with me powerful promise thank u rily needed to hear this!" "Happy Sabbath children of the Most high in Jesus' christ!! I really needed this rest for my week was really hectic. Now I'm resting, watching Hope channel Sabbath school. Glory be to Jesus!!" "Help me Lord when You think I need it..."
"I could not live without the word of God." "I hve really seen ur promises oh God, u r excellent"
"I leve it to you lord"
"I love the last line :)"
"I love this scripture, especially today"
"I really needed this today !" "It realy bls me...JESUS HE IS THE SOLID ROCK ON WCH I STND." "Lord God, thank you for the courage and spiritual strength to feel the fear and do what needed to be done, in Jesus name amen!" "Nothing compares to the promise I have in you, oh Lord"
"Patrice Robinson, Just as the post says, let's build on the spiritual, and keep strong on God's promises. We are healed by Christ's stripes, and he said that all was finished on the cross, all the work needed. So just have to ''Trust and Obey'', and GOD shall do the rest in your daughter's health. God bless you." "Thank u Jesus you said u will never leave us nor forsake...if we just live by faith"
"Thank you GOD and LORD of my life!" "Thank You, my Lord, for Your eternal word!" "Therefore I am ALWAYS exactly where I am supposed to be!" "This is also in Isaiah 41:10"
"This is one off the scriptures u don't forget,becouse u can always have challengers in life,and remember wat the Lord had said." "Yes despite what is happening GOD is still in control." ".Thank You Jesus, i read Psalms 35 this Morning..... Peace Be with EveryOne.... SunFlowers You..."
"�Yes, You have. Thank You, Lord�"
"1 John 4:4 You are of God, little children; and you have overcome them because greater is He who is in you than he who is in the world. PTL!!! :)"
"Am encouraged! bleesed be the name of the LORD"
"Amen & thank you Lord for been there 4 me in my hour of need!!!" "Amen and Amen!! Thank you Lord." "Amen brother and PRAISE the LORD." "AMEN LORD GOD JESUS..U R WORTHY TO BE PRAISE LORD GOD"
"Amen nd amen. This is only true when u keep to his precepts(walking in his path nd meditating on his word)." "AMEN o GOD of my fathers i give thank n prase 4 thou hast given me wisdom n strength"
"Amen! Command me O Lord God..."
"Amen! Glory to the Most High God!! <3"
"Amen! Wonderful msg. As I travel today. I will carry this message into my life. Godbless my trip." "AMEN!!!!!! LORD;;;; THANK YOU FOR EVERYTHING!!! !-)"
"Amen, fully trusting in the Lord!" "Amen, word of GOD give me power and make me more strong"
"Amen,i love u JESUS CHRIST!!" "Amen. Glory be to ELOHIM!" "Amen...dis prayer is 4 me ooo"
"And God will forever stand... Thank you Heavenly Father." "Be strong and of good courage, be not afraid, neither be dismayed: for the Lord they God is with thee whithersoever thou goest." "BEAUTIFUL WORDS TO COMFORT THY HEART! <3"
"Dats da word ov GOD"
"Dis verse is very touching Amen." "Dismayed, exactly what I have been feeling. Exactly the verse I needed to see." "Even though I walk through the shadow of death, I wil fear no evil 4 God is with me." "Even unto the ends of the world, AMEN"
"Even when we don't know what the best path, God has made it for us, for this moment, for this occasion, take it if you are wise enough." "Fear you dont have a place in ma heart"
"Glory to Him He's great all the time, I thank Him for the life that I have today!!!!!!!" "Glory to THE KING of KINGS." "GOD give only trial of his children...dont be dismayed GOD is faithful to us"
"God is so faithful to His promise." "God, that u knew 1 day i would b afraid so u commanded me so! What kind of love 4me. Love u Lord"
"He is indeed the tower of refuge"
"He is our shield so we are not afraid"
"He women returned to the tomb at sunrise, and that day was the first day of the week (Sunday). Clearly then, Jesus was crucified on Friday afternoon, the preparation day for the Saturday Sabbath. Read It And Weep Susan !" "Heavenly inspiration - not only spoken to the torchbearer of Moses - but also for you and I." "He'll be with us through out this day. Praise the Lord!" "His presence is with me ...."
"I confess help me my Lord!" "I did not realize He commanded this. So... I take it I don't have to be afraid or dismayed---it is comanded so...I can live in fairh...cool..."
"I have always preferred the KJV Bible." "I have this sittin on my desk"
"I like the Inspired Version of the Holy Scriptures." "I LOVE the Word of God! I read it everyday and it enlightens me!" "I love this commandment. My well springs up with this scripture when I am going through and when I know things that are ahead of me I put my trust in this commandment, knowing my God is with me all the way." "I Love this promise of Jesus , Thank you Lord"
"I love this scripture. It gives me the courage to hold fast in the face of adversity." "I need to see this!" "I needed that! Thanks for reminding me!" "I NEEDED THIS TODAY, IM IN A DEPRESSED MODE ALL I WANT TO DO IS SLEEP. cant wait to go to the lords house tomorrow Jesus be there he pick me up"
"I needed this verse this morning. Thanks"
"I praise God He is with me!" "I so love this Amen... God is so awesome and so worthy"
"I thank God for for the Bible. It keeps me in line." "I v trust in ur wordz!" "I was discourage but now full of courage Amen"
"I will be courageous. Amen"
"In Jesus name, i say Amen!" "In you God I put my trust ! Amen"
"Isn't is nice to have Christ watching out for us 24/7. It gives me so much inspiration. It reminds me of the poem "Foot Prints."" "It is a commandment to not be fearful." "It is good to know that my Father cares for me"
"Jesus also commanded his disciples and us also. Fear not for behold I am with you always, even unto the end." "Jesus will provide the all ur need(john 3:6"
"Jesus,wt a wonder you are!" 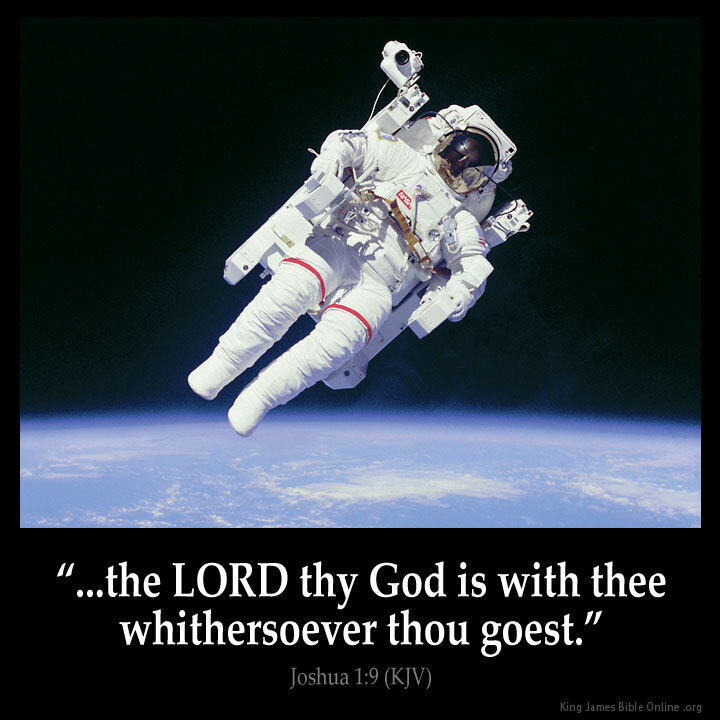 "Joshua conquered nations that all the way to Canaan.through this verse..for God(Jehova)is with him..."
"Jus wat we need in tyms lyk 2day"
"Like Your KJV Myself GBY Lady"
"Lord have mercy on me! Please forgive my sins! Jesus hear our prayer, Amen!" "LORD HAVE MERCY ON ME, BE MY GUARD, 4GIVE MY SIN & ANSWER ALL MY REQUEST. MAKE ME KNOW YOU MORE. AMEN"
"Love this so much! Thank You (alone) Father!!!!" "My favorite verse! Read this daily. Thank you for this one, I know everything will be great today." "My wallpaper on my phone is this wonderful scripture." "NO weapon fight against us shall prosper in jesus name AMEN." "One of my favorites. I even made up a tune to go along with it and played the piano to it. ( hey I've been weird Janice all my life why quit now?)" "One of my favorte verses"
"Our Lord is with us... We need not fear anything in this present age. He goes before us in all things. Amen!" "Praise almight lord of lords, God of gods, the king of kings, he is alpha and omega the begining and the end, the son of God mesiah, jehovah, the prince of prince is he,,,,lets prais the lord all nation and tribes he who created heaven and earth the base of human history and univesal is the a name greater than that ,,,, lets praise him"
"Praise His Holy Name.. Jesus!!" "Right now am in the face of difficulties and adversities, but i believe in your word cuz i know YOU are standing by my side to see me through it. And i know with YOU by my side am more than a conqueror and a victor. Thank YOU for your word." "So comforting,glory to God in d highest"
"Sometimes, being human, it's hard to remember that fact, and getting older doesn't help! :-)"
"Stay ye in repentance and Holiness 'couse this verse reffers to the rightous only." "Strong. powerful word, Thank u Master"
"Thank God for assurance of his words." "Thank God I need him every hour." "Thank u father for always carying me when i need to be...."
"Thank u Jesus 4 revelation of ur 2wards me & my family - Amen"
"Thank u Jesus, u are a wonderful Lord $ saviour." "Thank u lord .thank sooo much for ur word"
"Thank u Lord 4 d reminder n assurance." "Thank u Lord, a word in time"
"Thank u my sweet lord !" "Thank you for the wonderful word of God, it is a real blessing!" "Thank You God for Thine Love for me." "Thank You God for this powerful message"
"Thank you Jesus for always be by my side." "Thank you Jesus for your word is a is lamp to feet"
"Thank you Jesus Thank you Lord!!" "Thank you Karen i need these words every day . The Preacher is proud og you KJV." "Thank you Lord food for my soul"
"Thank you Lord for encouragement." "Thank you lord for the word today"
"Thank you LORD for this word of encouragement! I am more couragious now!!" "Thank you Lord for Your presence, it covers and comforts my heart." "Thank YOU Lord God, I need your strength everyday"
"Thank you LORD I am not Afraid, because you are with me....Amen..."
"Thank you lord ur awesome mandate. ALL IS WELL"
"Thank you Lord, I really needed to hear that today!" "Thank you Lord. I especially needed to see this verse this morning. :)"
"Thank yu Jesus your works are wonderful"
"Thanks be to the Lord!" "Thanks for the uplifting scripture, Kris!" "Thankyou God,ur word is my daily food i like so much.always i need ur guidens n luv.amen!" "Thanx 4 ua word. B strong in me 2day"
"That was the word for the day Sunday morning"
"The Lord always makes a way!" "The LORD is always with us all we have to do is call on him !!!! Thank You LORD for being there"
"The Lord is alwayz w us"
"The mercy of God is the breath that sustain our life.Thank you Jesus"
"The ONLY one book KJV BIBLE AMEN......."
"Thex lord 4 encouragn ma soul." "This is the word of God. And i wil never be afraid of terrow by nit or the arro that flly by day." "Thz wht i nid'd m about 2 sit for a terific exam in 2hrs! Amen"
"We give thank to the lord almighty.amen"
"We so often ask the father foe guidence or to help us with a situation that we are worried about and then he will assure ua all will work out but then we still wonder and worry, i am one of those sometimes and i really appreciate the stern answer God has given me. I can not do this on my own father and really need you to lead me and to slow me down sometimes. Thank you father for correcting me." What Do You Think of Joshua 1?